Posted on December 3rd, 2015. 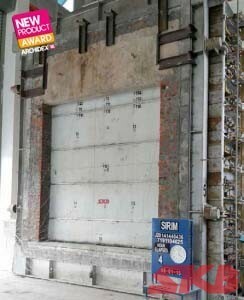 SKB Shutters is a Malaysian-based roller shutter and steel door manufacturer since 1957. This year, SKB Shutters achieved a breakthrough and launched its new range of Insulated Fire Shutters that aims to address performance, durability and reliability with a fabric-absent design. The earlier generation and presently still widely available insulated fire shutters are made of layers of fabric and steel – fabric serves the key properties of thermal insulation barrier and steel for fire resistance integrity. As building construction reaches its completion, the industry also begins to witness the immediate issues of product maintenance and longevity. This type of insulated fire shutters were showing signs of sagging below the ceiling level as soon as before the defect and liability period ends. Quickly the industry realises that product per formance testing for integrity may not necessarily reflect its durability and reliability over time, especially when we are looking at useful life of buildings to be on average between 20-30 years. These defect conditions are mainly caused by the condensation accumulated above ceiling level which are also where most fire shutters are housed to conceal its appearance when not in use. Condensation source comes from services that run above ceiling through compartments such was water, gas, air-conditioning and etc. It can be easily expected that at such moisture levels, mould and bacteria growth may likely be the case affecting possible indoor air quality issues. The panel shutter from SKB Shutters is an air-tight design to prevent direct heat transfer from one compartment to another on either side of the shutter. The steel panel construction is also sandwiched with insulation properties to limit heat penetration and extending the acceptable controlled temperature on the other side of the fire’s point of origin up to three hours and reliable fire resistance integrity. Although product longevity and durability is not tested for conformance, the composition and material used to construct the shutters are steel, a durable metal property itself. Being a panel shutter, the surface deflection is minimal and aesthetically more flexible in design and concealing its appearance when not in use. For shutters that remains shut at most times, steel panels are more durable to environment change such as temperature difference and possible intentional modification e.g. vandalism. Aesthetically it is designed to mimic a permanent wall except that is operable and flexible in opening and closing the compartment. Product longevity also touches upon product maintenance very closely and taken into account by users or owners you may say, as a parallel consideration. With a single operation mechanism versus double-roller mechanism (fabric and steel for each) for each complete unit of shutters also proves that additional effort is required to maintain the operating device. Key considerations were also given to reduce maintenance as panels should be easily replaceable when it is compromised by vandalism or environment change whereas fabric components are advised to replace the entire roll to ensure its performance. This proves to be costly and suggests extended down time for users as well. Hence, SKB Shutters is here to stay with the new generation steel-based insulated fire shutters specially designed for effective performance and durability. For more information, visit www.skb-shutters.com.